Thanks to @uk_james for proposing this weeks topic and volunteering to host the discussion. Please join us for what is looking to be an interesting first of three. This week’s #OTalk is the first of a series of three looking at how to meet the challenge of providing care and support to increasing numbers of people living with long term conditions, equal to, if not greater than the challenge of an ageing population. In total around 70% of the total health and care spend in England (£7 out of every £10) is attributed to caring for people with long term conditions (LTCs). 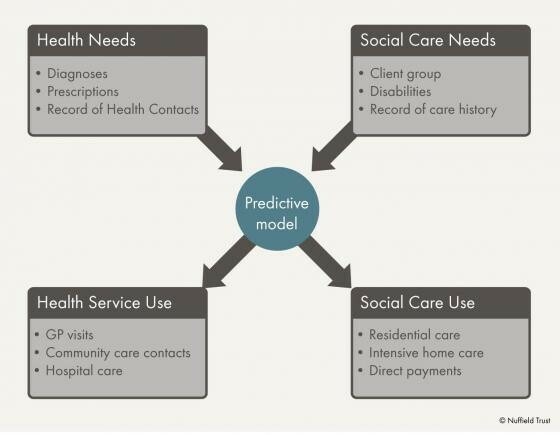 This week’s #OTalk is on the topic of risk stratification, which is all about how to use a predictive model to identify / case find people who are at the greatest risk of going into hospital. Risk stratification tools (clever software) can also be used to identify the people who can be offered targeted preventative and self care support. It’s a bit like crystal ball gazing – looking ahead in time and working with people now to prevent a crisis at a later stage. All too often, health and social care professionals work with people at or after a time of crisis, rather than preventing one in the first place. Follow @SirJohnOldham , GP and National Clinical Lead for Quality and Productivity at the DH on Twitter. He has been leading the LTC programme at a national level and tweets related observations. Gaining an understanding of the process of risk stratification. What is it and how to do it? Thinking about implications for practice – what does this approach mean for you? The next #OTalk in this series about LTCs on the topic of integrated health and social care teams will be Tuesday 5th March at 8pm.